Upcoming Events: L.A. to Santa Fe! Going to downtown artwalk? Have a cupcake while you're at it! Ten cupcake bakeries will compete for the title of best cupcakes during next week's downtown art walk. Each bakery will give out 300 mini cupcakes to the public (that's 3000 mini cupcakes total!). If a mini isn't enough for you, full sized cupcakes will also be available for purchase. There will also be DJs, a photobooth, and pop-up jewelry shops. 6-9 PM. Free to the public. 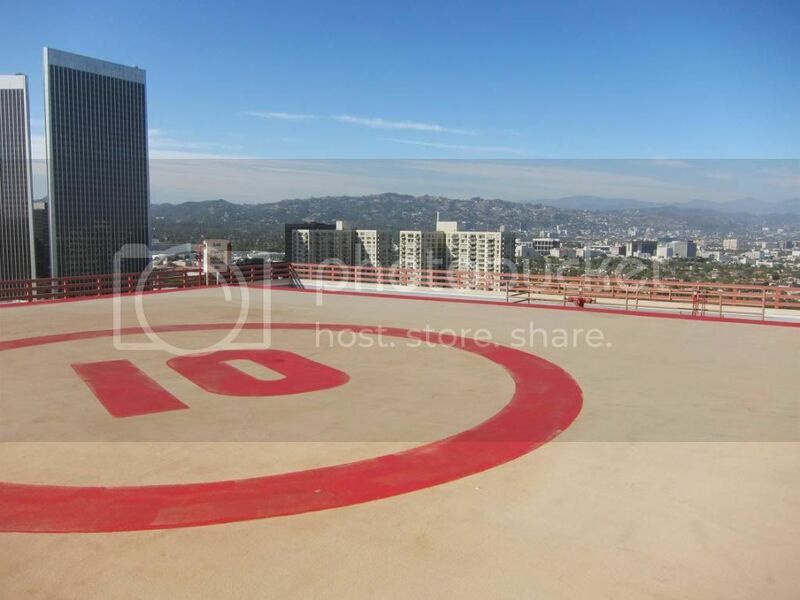 620 S Main St, Los Angeles, CA. This is one of LA's most interesting events as it prominently features the city's best Latin cuisine along with Latino-owned or operated wineries in Napa! This year, the fifth annual East LA Meets Napa will also feature some wineries of Baja California from Valle de Guadalupe in commemoration of Mexico’s Bicentennial celebration. The restaurant lineup includes Rivera, Loteria Grill, Cook's Tortas, Phlight, Cacao Mexicatessen, and much more, and will be accompanied by wines from Beringer, Ceja, Sequoia Grove, and more. Tickets are $150 and can be purchased on www.eastlameetsnapa.com. 6-9 PM, Union Station, 800 N. Alameda St.Los Angeles, CA 90012. 40 LA vendors including Jar, STREET, Valerie Confections, Breadbar, Dr. Bob's Ice Cream and more will join in this fundraising extravaganza for the Saban Free Clinic, accompanied by over 80 wineries including Gruet and Stag's Leap. The Saban Free Clinic provides freemedical, dental and social services to the needy. This year, the Clinic will provide nearly 90,000 free patient visits to those who need them the most. Tickets are $80 before July 1 (VIP tickets are available for $200). As of July 1, tickets are $100 and $225, respectively. For more info or reservations, call 323.330.1670 or visit www.thesabanfreeclinic.org/extravaganza. 7-10 PM (6-10PM VIP). 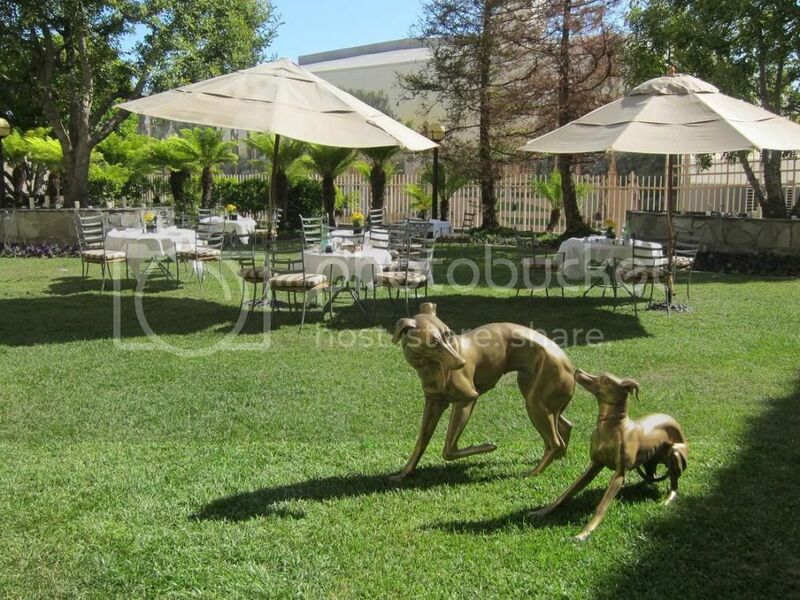 Sunset Gower Studios, 1438 North Gower Street, Hollywood, CA 90028. This is also the 13th year for Taste of Santa Fe, which raises funds for the New Mexico History Museum. The event starts with a gala dinner on July 16, featuring four chefs from Santa Fe and LA's very own Chef John Sedlar of Rivera, who grew up in Santa Fe. There will also be blind judging taste competition, a live auction, and plenty of champagne and wine. 6-9:30PM. New Mexico History Museum, Santa Fe, NM.. The next day follows with a "Community Taste Event" with 50 food/restaurant stations (+4-5 dessert booths) and 8 wine stations. For Californians trying to get to know the Santa Fe food landscape, what could be a better opportunity? Tickets are $25 for 12 tastes or $35 for 18 tastes. 2-6PM. Santa Fe Railyard Park, Santa Fe, NM. Let's face it, I love raw seafood. Even after watching The Cove, I still went to Culina to try their crudo (but I have been avoiding tuna more, and definitely am not planning on eating whales or dolphins). 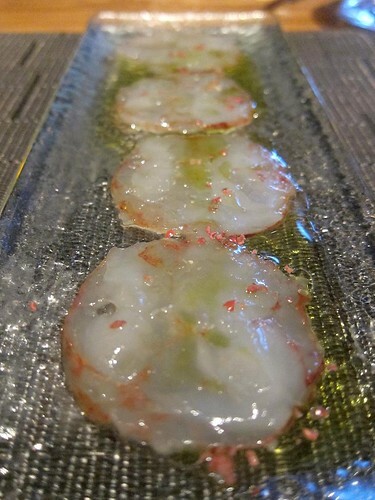 While I managed to indulge in crudo heaven at Marea in NYC, in LA this dish is still relatively hard to find. 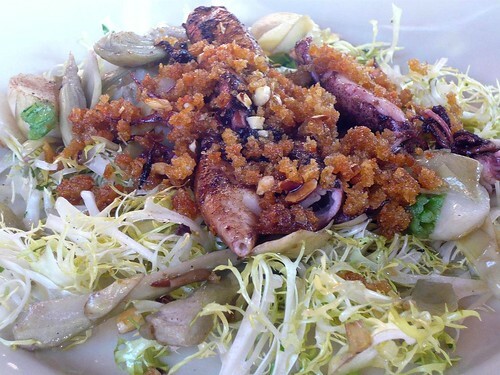 I was bummed when the now-shuttered Blanca in Newport Beach stopped serving crudo. Luckily, the new restaurant at The Four Seasons in Beverly Hills, Culina, moves in to fill the gap. The place is large and swank, of course, being Four Seasons and all. 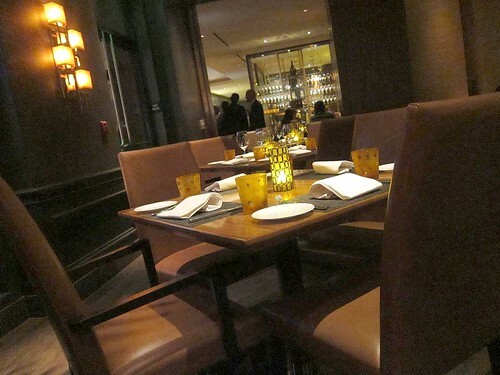 Dimly lit, dark leather chairs, the whole lot, with an almost equally large outdoor dining area. They also have a crudo bar where you can watch them slicing your raw fishies a la a sushi bar. 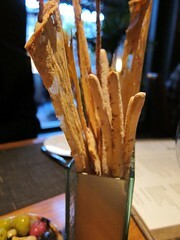 To start: breadsticks and olives. By the way, the olive oil here is supposed to be so good that they sell it by the bottle in case you want to take it home. I wanted a glass of wine and asked the sommelier what would work best with the crudo I'm ordering. 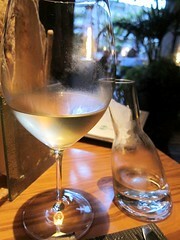 She recommended the 2007 Vermentino (Tuscany), which did work well for some, though not all, the crudo. I can't go to Culina and not have the crudo. 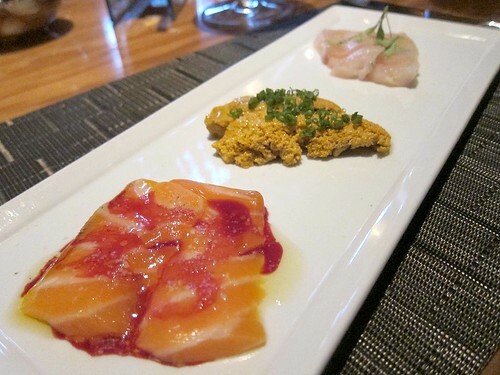 Unable to make up my mind, I just ordered the Crudo Sampler: three choices, $22. Salmone - loch duart salmon. caper salt. blood orange. I liked the acidity and sweetness that the blood orange lent to the fatty salmon. 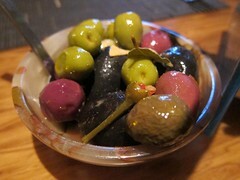 The olive oil added another layer of richness to the sea urchin. The yellowtail was prepared simply which worked even better, focusing on the wonderful flavor and texture of the yellowtail itself. It's amazing how food changes texture between its raw and cooked state. This was easily my favorite dish besides the crudos. The harissa gave the little tender octopus a wonderful flavor. I would definitely order this again. 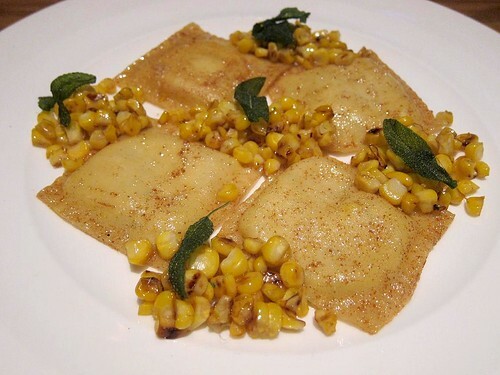 Stuff anything with sweet corn and I will eat it. This was made even a tad bit sweeter with the brown butter coating. We enjoyed this dish quite a bit, although $18 for 4 corn raviolis did not seem as good a deal as the previous $14 octopus. I found this way too "mushy" for me - I felt like I was eating mashed potatoes. It was meant to have that texture, however, and my dining companion enjoyed it, so it may just be a matter of personal taste. We also ordered pappardelle with lamb ragu, which was good albeit a bit salty. 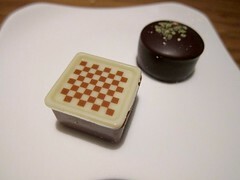 A couple of mignardises to end the night. 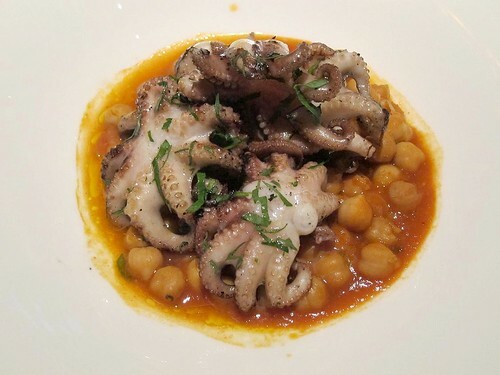 The strength of my Culina meal was definitely the seafood, both the crudo and the polipo harissa. 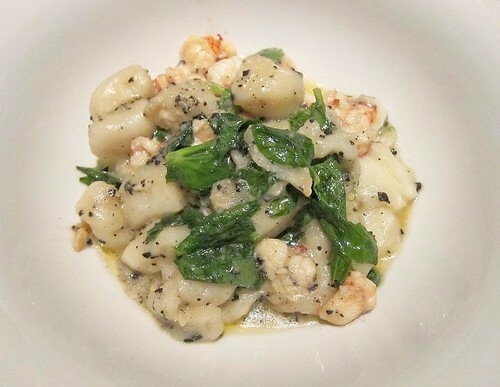 The pastas were more hit and miss, and even the hits weren't as high as other Italian restaurants around town. But there's nothing wrong with a restaurant with a specialized strength. I know where to go for crudo in LA, and that's enough for me. 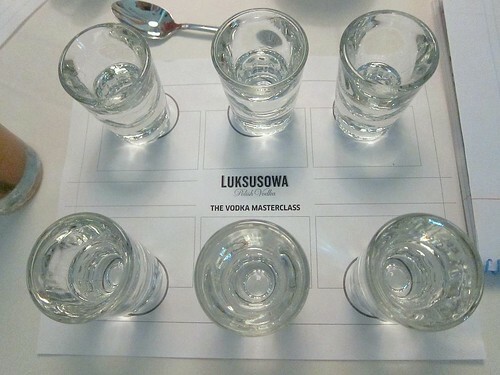 Luksusowa Vodka Seminar & Tasting: Can You Taste the Difference? "Vodka is colorless, odorless, tasteless." I pretty much believed that too, so when an invitation to a vodka seminar and tasting set up by Luksusowa vodka came along, I was intrigued. Will I really be able to taste the difference between different vodkas? I wanted to see. The vodka seminar is appropriately held at at Nic's Martini Lounge, a shrine to vodka in Beverly Hills and the home of the "vodbox" where you can enjoy their extensive vodka collection in a private chilled room while wearing their stash of fur coats. The seminar portion started with the history of vodka. Believed to originate from Poland (the first written evidence is a 1405 Polish manuscript), potato vodka became more popular in the 18th century because it is believed to be superior although the filtration method is more difficult. Charcoal filtration was started in Russia and is now believed to be the best method. 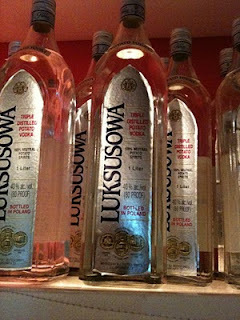 (Luksusowa is supposed to be the highest rated potato vodka in the world, with a score of 94 from the Beverage Tasting Inst.). The World War II destroyed the economy in Poland and Russia and many distilleries came to be sold to independent owners. Vodka originally wasn't very popular in the US and they had to market it as the "white whiskey". It was apparently all thanks to Smirnoff that really popularized "vodka" and made it what it is here today. In 1975 Smirnoff outsold American whiskey. Leading the tasting was the owner of Nic's himself, Larry Nicola a.k.a. "The Vodkateur." On each table were a variety of items/nibbles meant to represent the more common flavor profiles of vodka (I was hungry and thought they were apps so I'd been eating them. Oops!). Anyway, there were rye bread, potato chips, sour cream (acidity), pop corn (representing butteriness of some vodka), dark and white chocolate chunks (bitterness), and "licorice." We sniffed and sipped six different vodkas at room temperature (since chilling it often masks the underlying nose and flavor - this way you can more easily tell the differences). Svedka (wheat, Sweden). This smells more subtle and also tasted creamier, smoother. SKYY (wheat, USA). Odorless, tasted clean. Pretty much tasteless but went down pretty smoothly. Sobieski (rye, Poland). Smells slightly sweet. Had a nice flavor profile but harsh. Finlandia (barley, Finland - obviously). I was surprised that it does actually taste like barley. This had a full bodied flavor. Luksusowa (potato, Poland). Smells ... like water, really. Clean, without a harsh finish. Definitely the best of the bunch, and I'm not saying that because they're sponsoring this event. Charles Vexenat, author of Mixellany's Annotated Bariana: A Practical Compendium of All American and British Drinks and a London-based bartender, was behind the bar making cocktails for us. 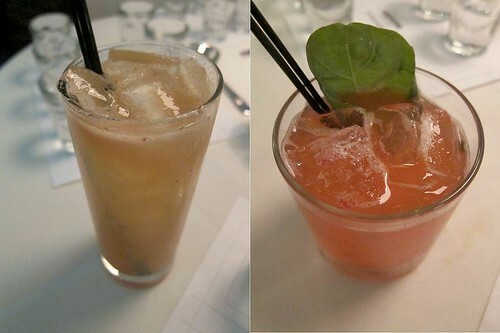 The first cocktail I tried (left) was made with vodka, OJ, fig jam and lime juice. A sweet cocktail, but not cloyingly so. It's actually pretty good and balanced. The other drink was made with strawberry and basil. Less sweet with more depth. 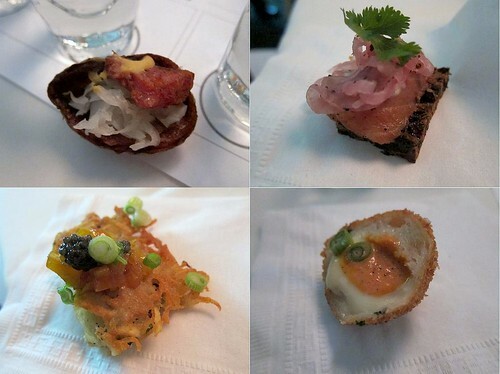 After we finished the tasting, Nic's provided some appetizers, all of which were supposed to complement vodka. You'd notice ingredients like rye and potato over and over again and if you're lucky, caviar. A nicely crispy roasted potato with sauerkraut and kielbasa sausage, "vodka salmon" on rye bread, potato latke topped with apple compote and caviar - and can't remember exactly what the last one was. Vodka definitely gets a bad rap among my cocktailian/bar-regulars friends, but this ended up being a pretty cool seminar and taught me that I knew so little about vodka and I can't just dismiss it without learning more. I learnt a lot of about the history of vodka and I was surprised at how distinct the different vodkas tasted. Among the six, Luksusowa was definitely the crowd favorite and I was pleasantly surprised at the prices I found online, but I really need to have Larry guide me through more different vodkas in the vodbox. 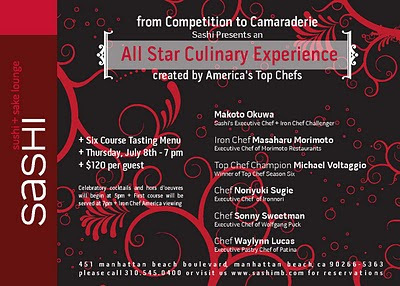 Celebrity Chef-Studded Dinner at Sashi! 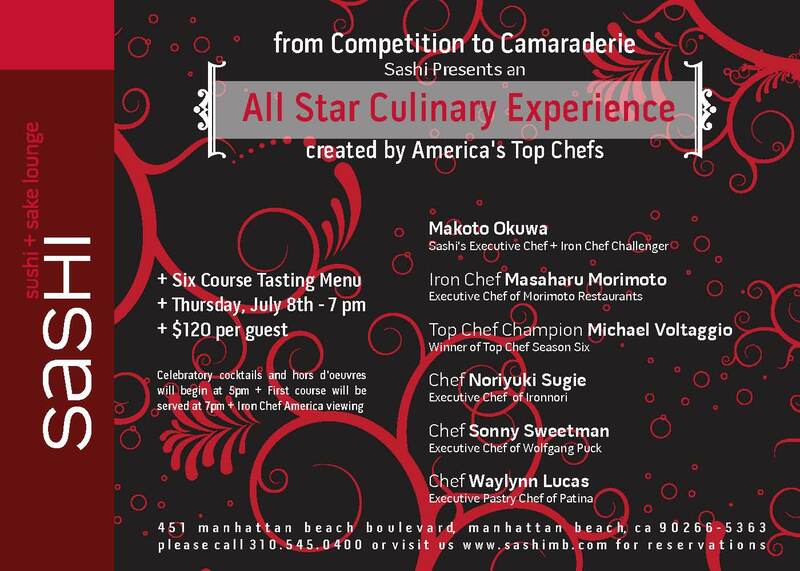 Chef Makoto Okuwa at Sashi is no stranger to the ever popular Iron Chef show, but although he's had years in the show under Iron Chef Masaharu Morimoto, Thursday July 8 marks his first appearance as the lead chef and challenger. He's pulling all the stops to celebrate, too, and that's where you can come in. That night, he will bring in Iron Chef Masaharu Morimoto and Top Chef champion Michael Voltaggio, plus chef Noriyuki Sugie (Ironnori/Breadbar), chef Sonny Sweetman (Exec chef of Wolfgang Puck), and chef Waylynn Lucas (Exec pastry chef of Patina). The six of them will prepare 1 hors d'oeuvres and 1 dish each. Cocktails and hors d'oeuvres will be served at 5 pm, and the six course dinner + Iron Chef America viewing will start at 7 pm. Of course, all the rockstar chefs will be mingling with guests in the dining room. And that's why you'll pay the $120 price tag. Call (310) 545-0400 to RSVP. 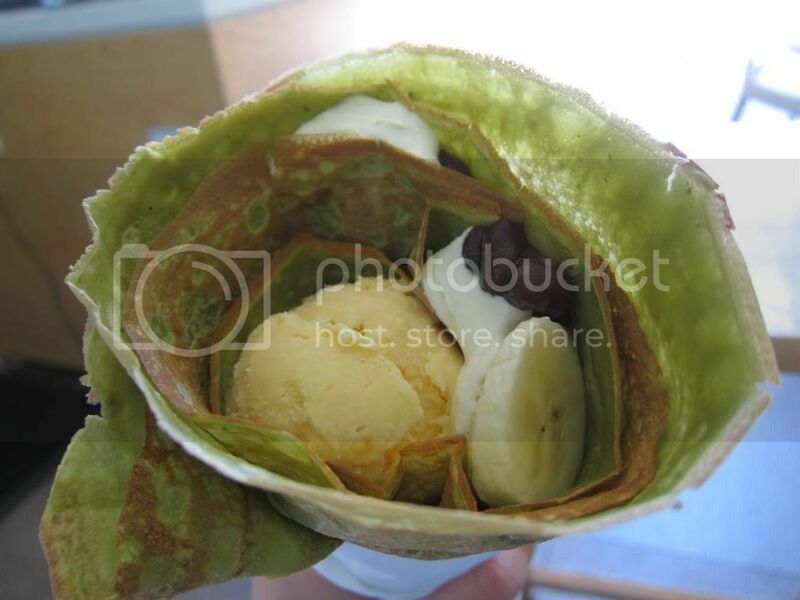 A recent Groupon for 50% off at Harajuku Crepe piqued my interest to try this Tokyo-style creperie. Mochi in their batter? Green tea or Earl Grey flavored batter? As a tea and sweets lover, count me in. Harajuku Crepe took over the small former Fulfilled space along the rows of high end shops of Santa Monica Blvd in Beverly Hills. Street parking is hard to find but there is a metered parking lot behind the building one block over. Harajuku Crepe offers organic crepes, sweet or savory. They add mochi powder in their crepe batter, giving it a more elastic and chewy consistency that I really liked. Choose among four batter flavors: original, buckwheat, green tea, or earl grey tea. Fill it with fruits, red beans, nutella or chocolate sauce, and ice cream - or for the savories choose between tuna/ham/egg/turkey/etc. I tried the green tea crepe with red bean, banana, whipped cream, and vanilla ice cream. All the crepes here are rolled up into a cone so you can just grab it with your hand and eat it that way. No need for forks and knives! As I've said, the batter here is unique and worth a try. Harajuku also has a small but good selection of teas which are all brewed at the right temperatures for the right amount of time. And the topper? Free wi-fi! Last year a trip to the Bay Area ended up being one of the best food weekends ever. As soon as I land we caravaned to Berkeley, kicking off the weekend with some Alice Waters brunch at Chez Panisse Cafe. Located on the second floor of the building, the Chez Panisse Cafe was packed to the gills during this Saturday brunch. Just looking at the menu will give you an idea of the style of food here. 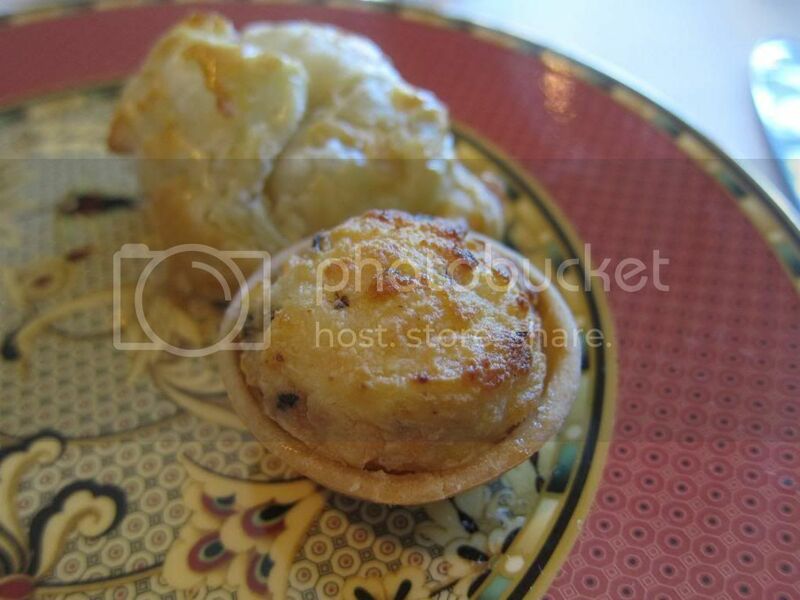 The ingredients high quality and enticing, the preparations relatively simple but bound to be excellent. I tried a bite and it was quite good, a nice combination of flavors, though it was too weird for my friend. 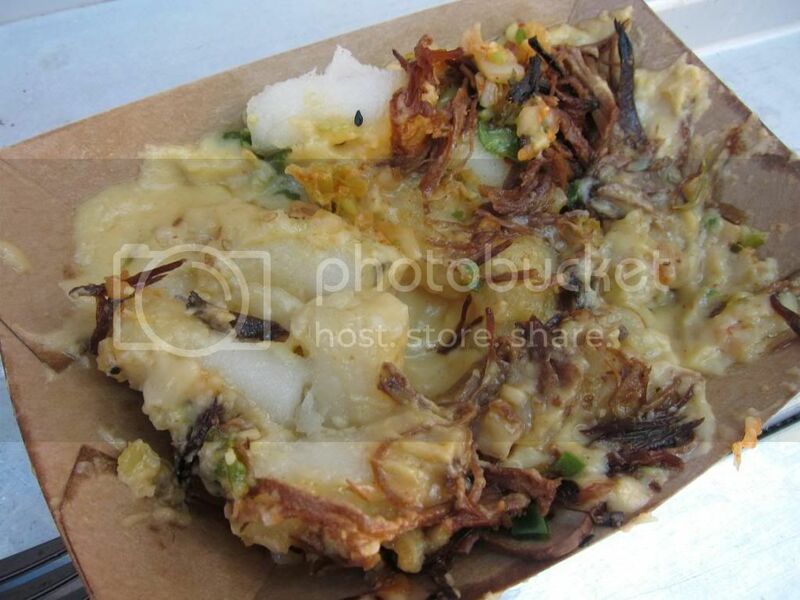 Though what's visible is mostly the cardoon, the anchovy flavor was quite strong. 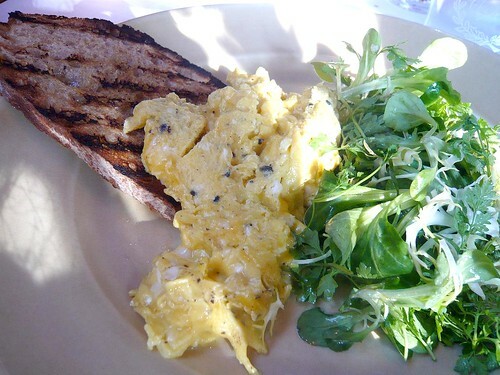 Enticed by the word 'truffle' on the menu, I decided to go really simple with Scrambled eggs with black truffle, grilled garlic toast, and chervil salad. 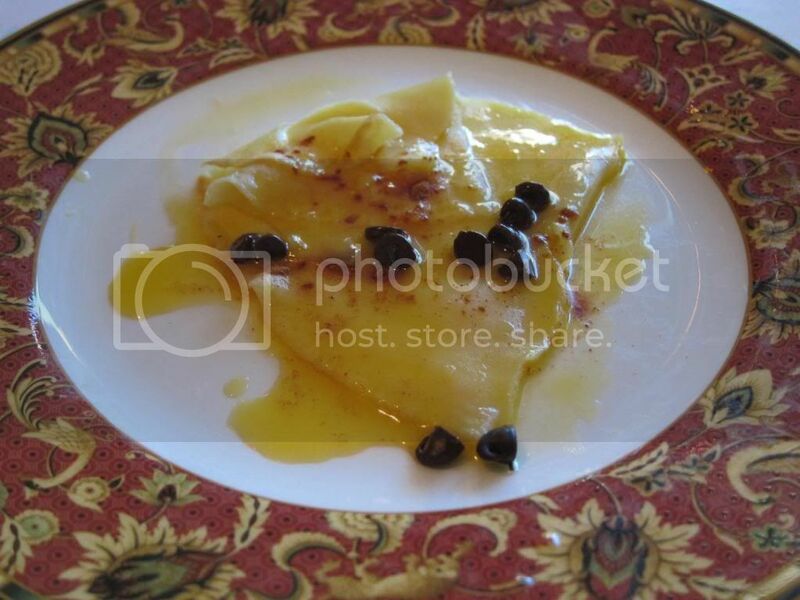 Softly scrambled eggs, strong truffle aroma. As a truffle lover, no complaint. But then I got cephalopod envy. I loved the texture of the tender roasted squid along with this drier version of romesco sauce. Both worked very well with the frisee. 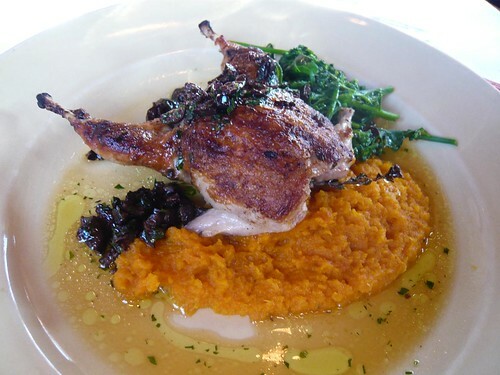 Grilled Wolfe Ranch quail with winter squash puree, broccoli, and black olives. Another great dish. The butterflied quail was very moist and tender and you can tell the quality of ingredients used here at Chez Panisse with the broccoli and squash. Growing up I came to dislike the dried up store bought broccoli. None of that here, naturally, as expected of Alice Waters. On the whole, the desserts were very good but rather expensive. 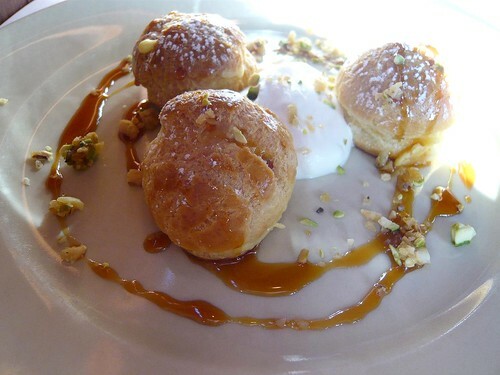 Good cream puffs, but better and bigger can be bought for over $3 apiece. 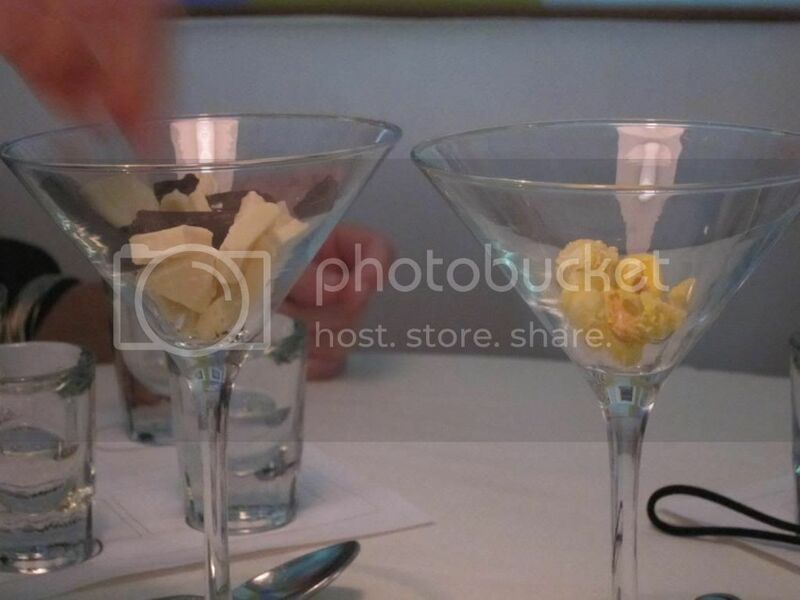 This was actually our favorite of the desserts. 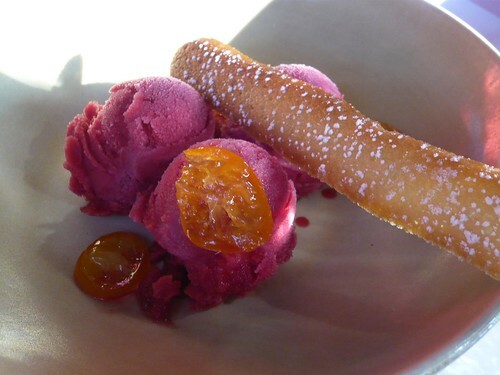 An amazing sherbet with strong blood orange flavor, but over $8 for 3 scoops still seems very steep. 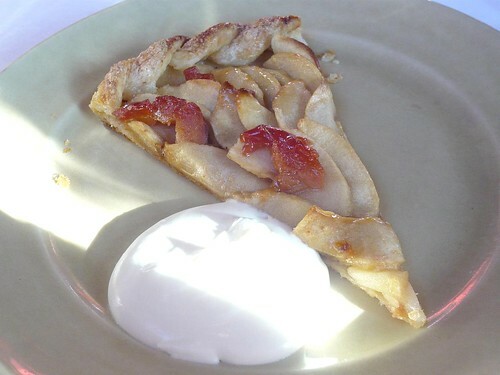 This small and thin tart was possibly the most expensive tart I've paid for ... again, good, but not sure it was worth it. 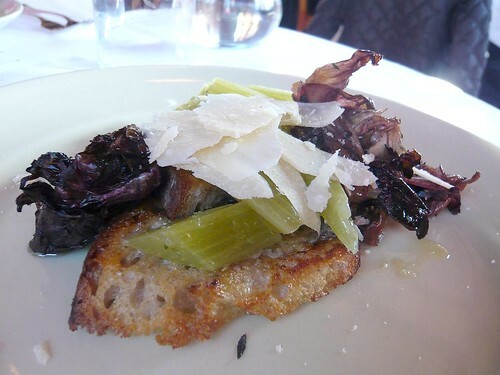 Overall we were very happy with Chez Panisse Cafe, especially with all the savory dishes - all of which used amazing products and were excellently prepared. Given another chance to visit Berkeley, I would probably end up here or at the restaurant again, though next time I'll skip dessert and go around the corner to Gregoire's for dessert instead. On Sunday June 27, Chef Christopher Kostow from The Restaurant at Meadowood in Napa Valley will be preparing a special five course meal (+dessert) at Melisse, kicking their Summer Guest Chef Series. California Halibut with Serrano "Skin"
A portion of the proceeds will be donated to The Special Olympics. For reservation please call 310-395-0881 or visit OpenTable. 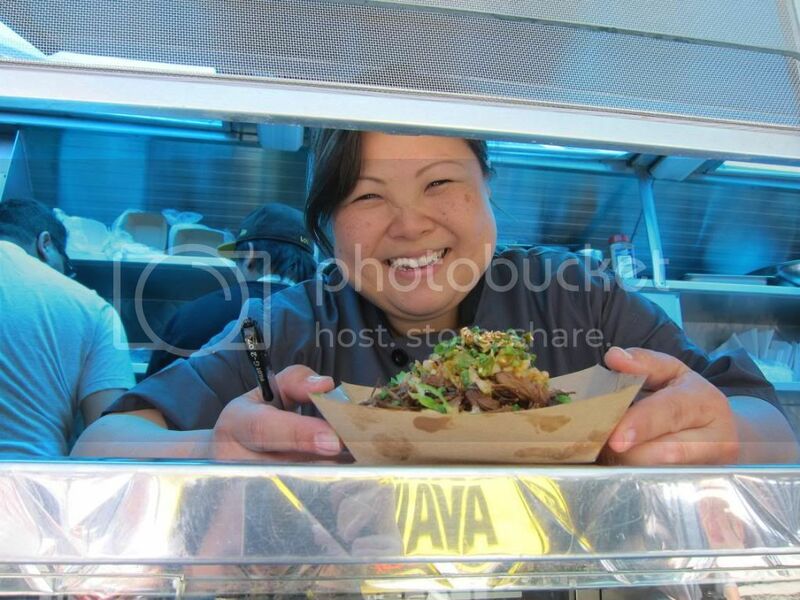 Sneak Peek of Debbie Lee's Ahn-Joo Truck: Korean Pub Grub, Minus the Pub. Seeing Chef Debbie Lee's Korean-Soul food on America's Next Food Network Star was intriguing. So far I haven't gotten the chance to try it, but now Chef Debbie Lee just launched a food truck touting "Korean Pub Grub" and a soon-to-open restaurant. Starting tonight, the Ahn Joo truck will be at the LA Film Fest serving filmgoers who don't feel like patronizing the LA Live establishments. 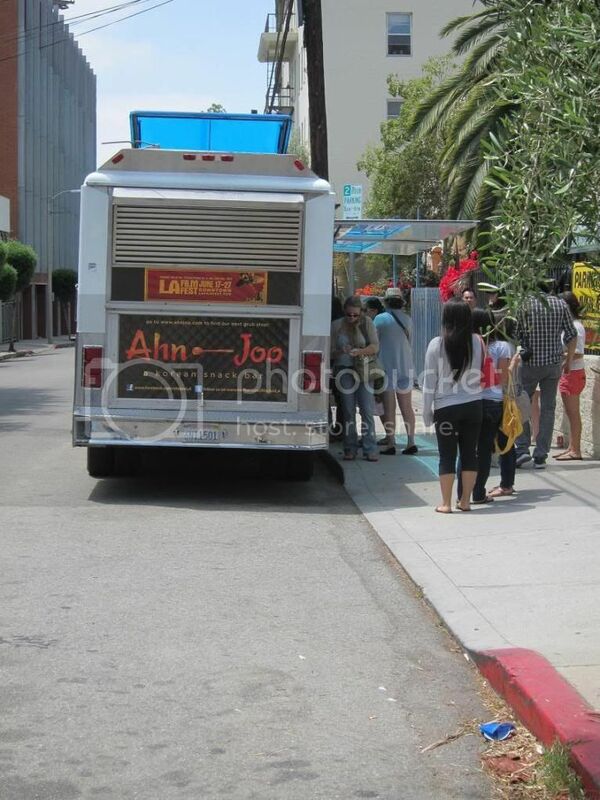 Two days ago Chef Lee held a sneak peek for their truck, Ahn-Joo, for some bloggers (and random passersby) near their office in Hollywood. She was on hand taking care of customers, and at least in the early days you can probably count on finding her inside the truck. 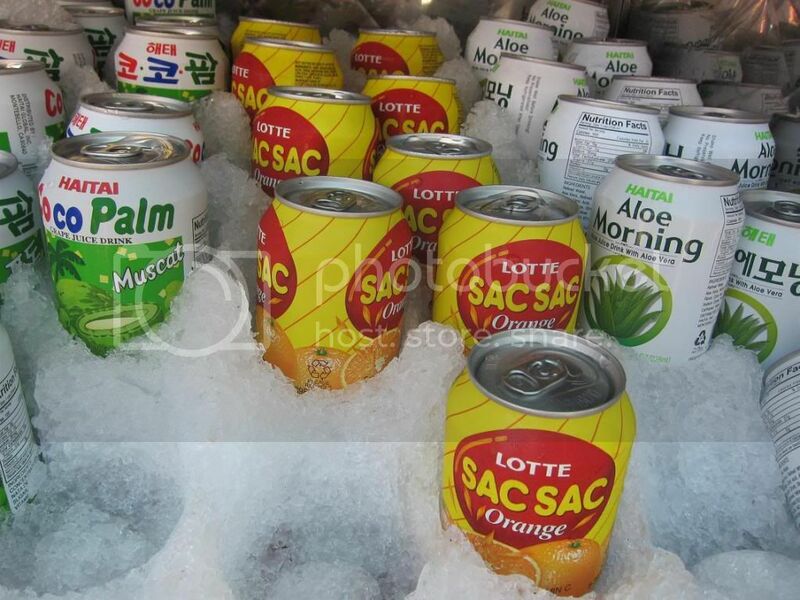 Ahn-Joo will also be selling some Korean sodas, like the grape coco palm and aloe vera. All the robata skewers are $3 for an order of 2-pieces. Here's the Salmon, Scallion, Korean miso honey. 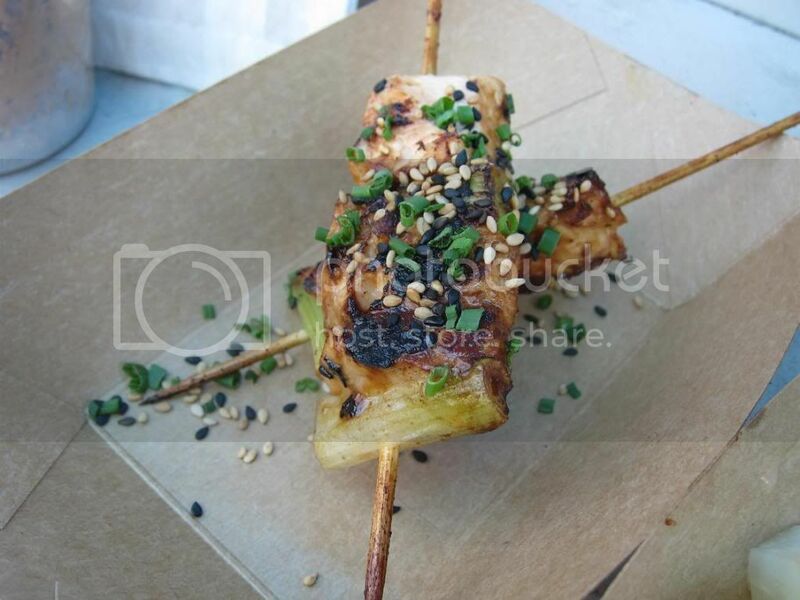 I also tried the chicken skewers and both were good with moist and tender pieces of chicken/fish and good flavors. They're also easy to eat on your feet. 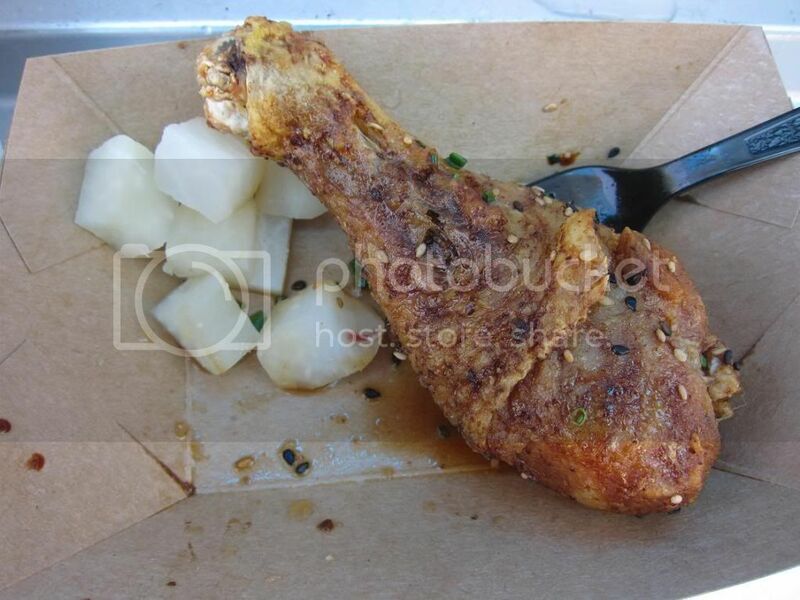 Korean Fried Chicken (garlic glaze): $7 for 3 LEGS! By the time I got there, there was one piece left from a previous order, so I just grabbed that one. Yes, I love that she gives all legs. Dark meat FTW. Moist, tender, and flavorful with crisped skin glazed with a sweet sauce (although I could use more garlic flavor personally), like a proper korean fried chicken should be. Minus the heat of a spicy sauce. And the beer. The most notably different dish was the Korean Nachos ($7). These are fried rice cakes with smoky chile queso, soy braised pork, and kimchee salsa. Sorry that it got mutilated before I took a picture of it. A fun use of the chewy ddukbokki here as "nachos". A lot of bold and heavy flavors going on, making it a tasty bite and both a good drunken/hungover food. 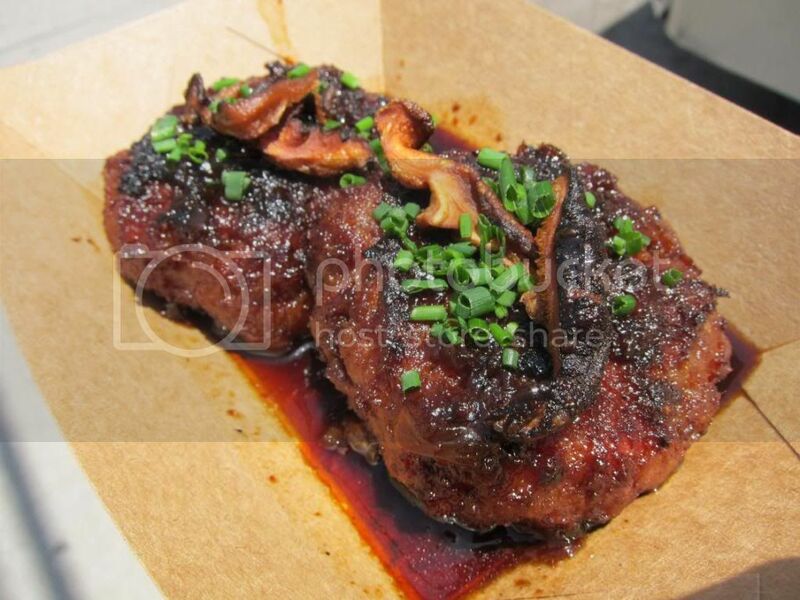 Mama Lee's Meatloaf ($7) is made with ground rib-eye, soy onion demi, and topped with crispy shiitake. The meatloaf was very moist, and her use of rib-eye meat gave it quite a nice flavor. I would've liked something to go with it though, or perhaps less sauce as it was a little salty for me. I liked the crispy shiitake because it provided a much needed textural contrast to the tender and moist meatloaf - while I liked the meatloaf itself quite a bit, I needed to balance the texture if I were to eat 2 pieces of it. Personally I'd like to see more of the crispy shiitake here, or some carrots perhaps? 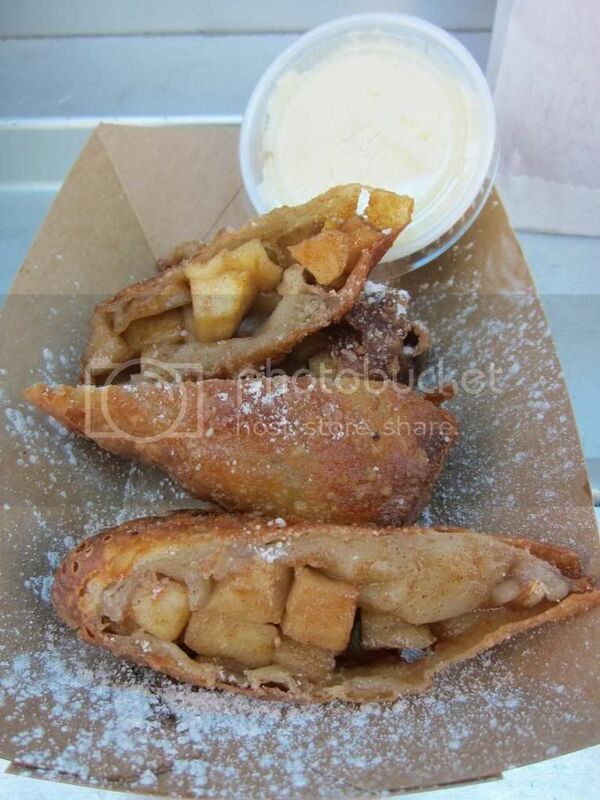 There are only two desserts on the menu right now: Grilled Nutella Bhang which looked like nutella toast (didn't try it) and Fuji Apple Eggroll with ginger mascarpone. Both are $5 per order. Still warm and crispy, I enjoyed this dessert although it was a little hard dipping it into the ginger mascarpone - since we were sharing and I didn't want to double dip. Also, I could barely taste the ginger in that mascarpone. Being a ginger lover: more ginger, please. I also got to take home the Spicy chilled buckwheat noodles with fuji apples and korean veggies ($5). This was a nicely portioned buckwheat noodles with spicy gochujang sauce and sliced hardboiled eggs, fuji apples, carrots, pickled onions, and cucumbers. Perfect for the summer, really. I felt that I got a glimpse of Chef Debbie's Korean soul fusion, though I'm still waiting for my chance to try that galbi pot pie. Of course, the truck was meant to be "Korean Pub Grub" so I shouldn't be complaining that most of the dishes I tried leaned strongly Korean instead of the fusion that I was curious about. Some of the items are fairly priced but a couple I felt were a bit more than I would expect from, well, a truck. The food we tried was quite good, but since I did feel a glass of cold beer would go well with some of them, I'll be looking forward to the restaurant. 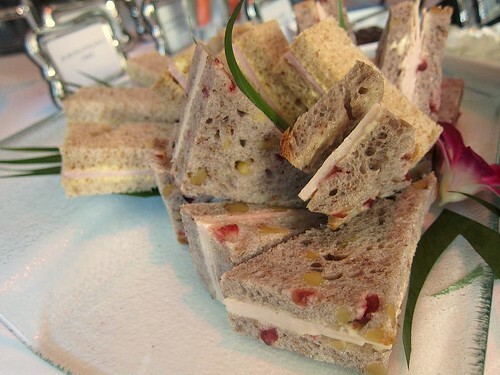 Afternoon tea is a luxury, not just in paying for it but also taking the time in the middle of the day and is pretty much an extra meal between lunch and dinner. But if you can afford that luxury of time, it's certainly a great way to spend your afternoon with friends, relax, and pamper yourself. In England everyone might take afternoon tea all the time, but here it is more the home of many a bridal shower and girls getting together exchanging Christmas presents. For these events, then, atmosphere, ambiance, and appearance are all the more important. 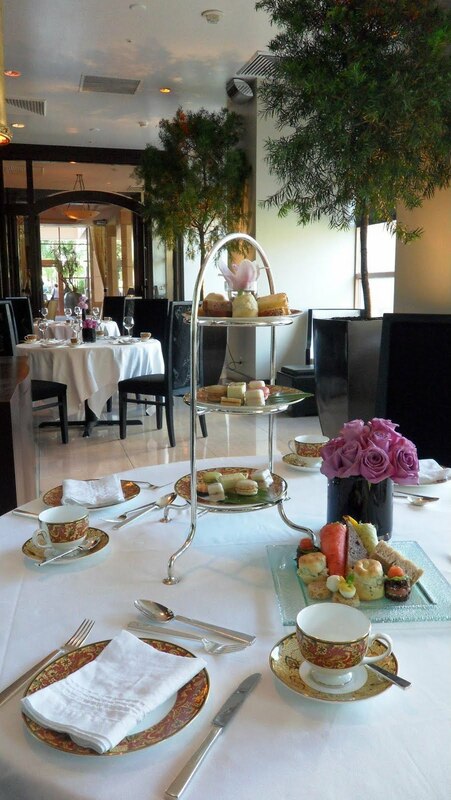 Afternoon tea at the InterContinental Hotel in Century City provides just that. Set either in a lovely and quiet side room facing the courtyard, or weather permitting, on the courtyard itself. 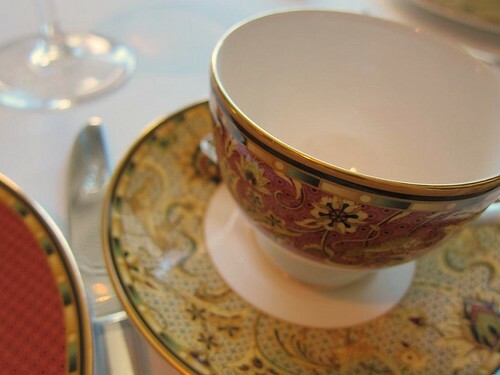 The china that they're using for the afternoon tea has been used at the hotel since its first inception. 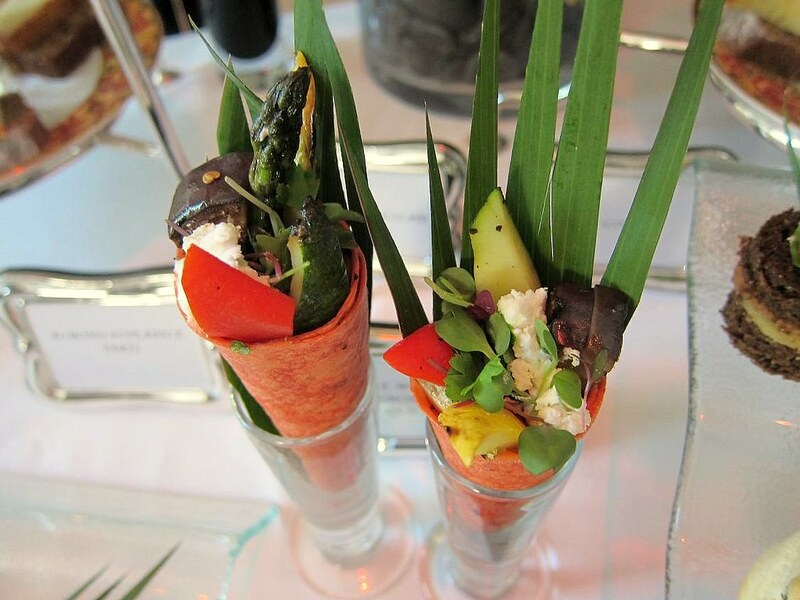 There are two ways to enjoy your afternoon tea here at Park Grill. You can either order the afternoon tea set for $21.50, or order individual items a la carte to create your own tea set. For the set, your choice of tea includes some with fancy names that unfortunately gave me little clue as to what they are: Lady Grey, Prince of Wales, Decaf Earl Grey, Organic Dragon Lily Flowering Tea. 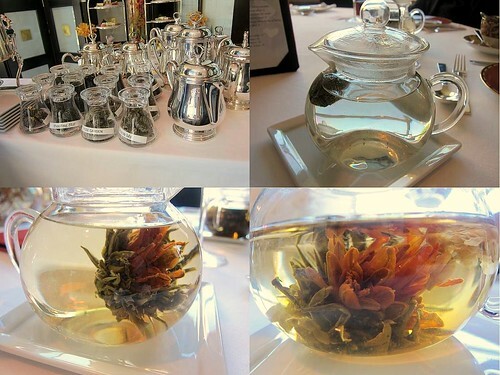 If you were to order a la carte, the regular loose leaf teas are $6, while the "flowering teas" are $8. 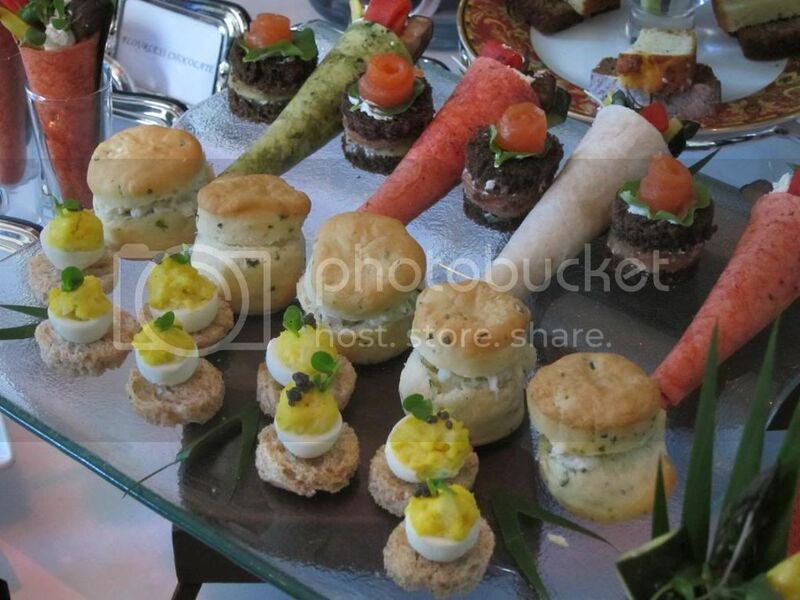 For this media event, we got our choice of any of their teas, all lined up on a white linen covered cart. I got one of the "flowering teas", the Jasmine Lover, which is served in a clear glass pot so you can see it bloom. Bloomed into quite a pretty orange flower, didn't it? It tasted pretty good too. Scones with Clotted Cream and Preserves, Lemon Cake, Zucchini Bread. The scones are fine though I liked the buttery scones at Gordon Ramsay better. My British friend told me scones are supposed to be kinda bland though. That's what the clotted cream and the preserves are for! 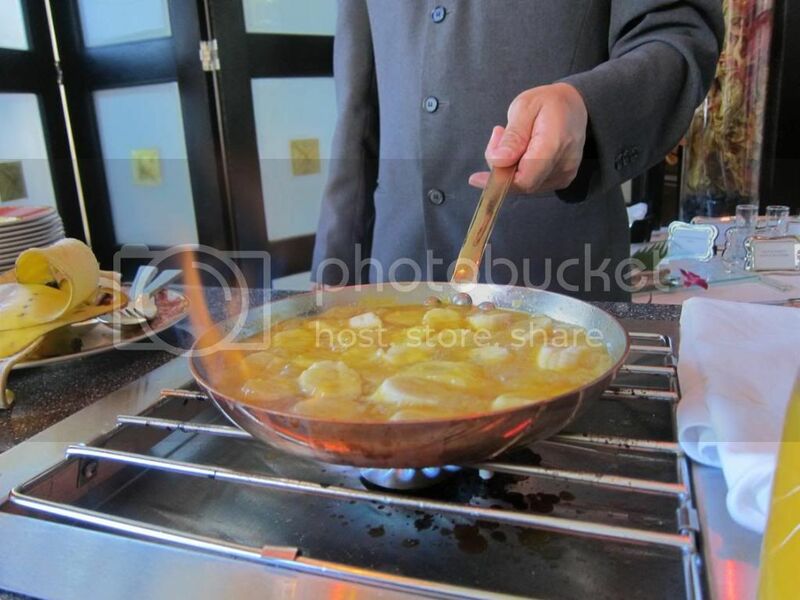 For the tasting we actually got to try both the crepe suzette and banana foster, both of which are prepared tableside. Both are topped with some chocolate chips, which everyone seemed to like. 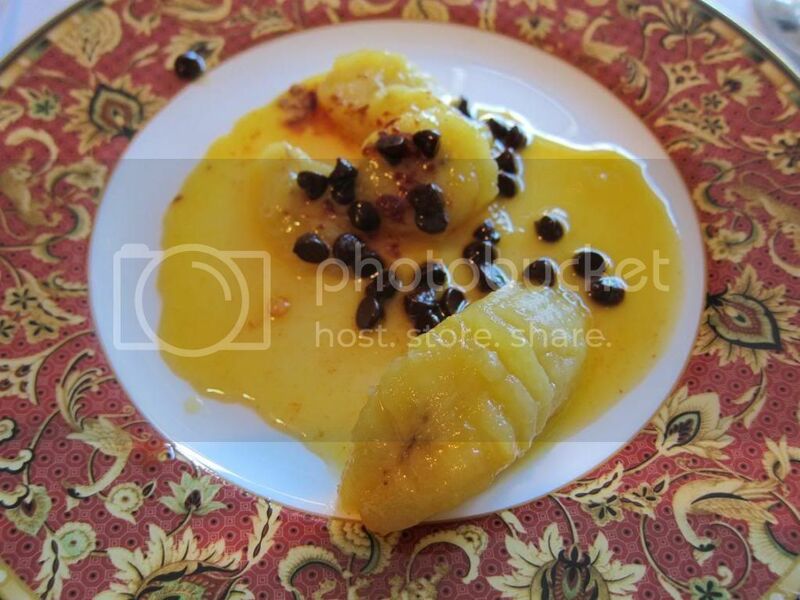 I thought it was too sweet for the crepe though it did work well with the bananas. 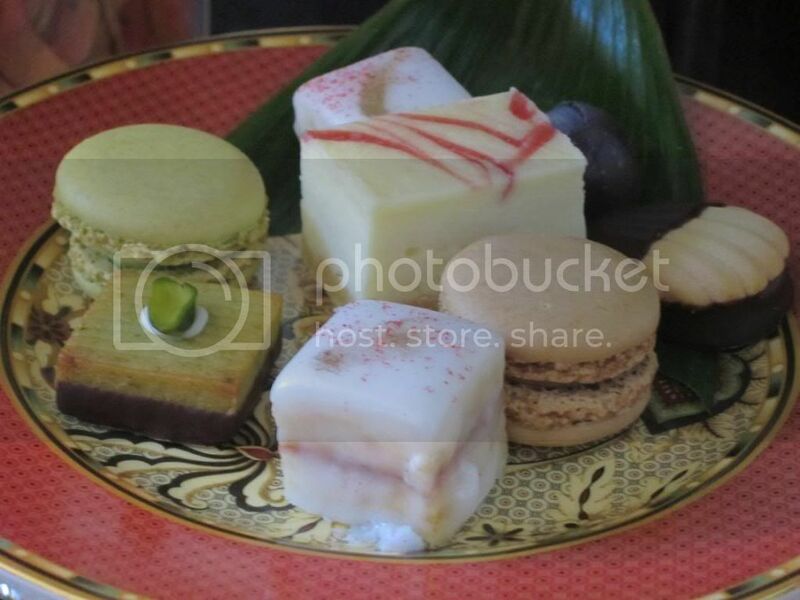 Petit fours to end. There was only a piece of each to share with everyone, so I only tried the macaron, which was good. If you're organizing something for your girlfriends, this is the place to get some "ooh"s and "aah"s from the blooming tea to the tableside crepe suzette/ banana foster. Everyone likes a show.